Bin Junmper brandable game by Galaxy Graphics. Flash Games licensing. In short: Use one wheelie bin to jump as many others as possible. Whilst this game might involve jumping a wheelie bin, it could easily be a different item such as a motorbike, a hot rod, a water skier, or your product fitted with wheels - leaping over the competition. 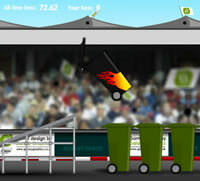 Ideal for any situation and especially those concerned with motorsports or track based events, the game has a wealth of branding opportunities such as the trackside boards, the flags and the bin itself. The reworking of the game could be taken further, into a snow track with a skier or perhaps a Christmas sleigh jumper, or changed into water with a water-skier jumping sharks for example. With a limited maximum jump, the game is ideal for promotional campaigns where a prize is offered for the longest jump, as the opportunities to cheat are virtually impossible. As with most of the other games offered by Galaxy Graphics, the game supports a score table via PHP and mySQL, though this is easily adapted to support whatever score system and server you use. Click here to see the current leaderboard (opens a new window). Looking for Bin jumper source code / Actionscript / .fla file ? The source code for this Flash game is also available to buy from Galaxy Graphics. Click here to contact us about Bin Jumper Source code.